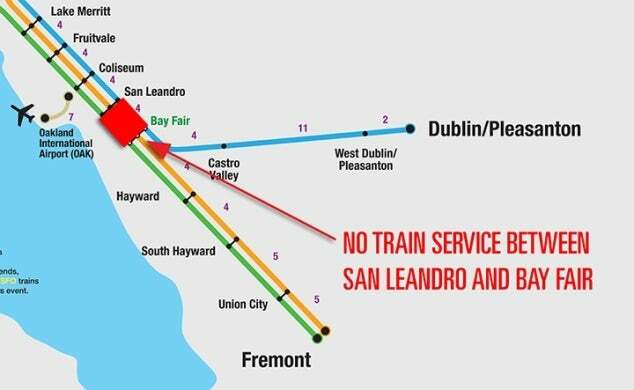 There will be no BART Train service between the San Leandro & Bay Fair stops during Easter Sunday on March 27 when the Warriors play the Philadelphia 76ers at Oracle Arena at 5:00 p.m. BART will provide riders with a bus from San Leandro to Bay Fair, but Warriors fans should expect a 30-60 minute delay if coming to Oracle Arena from Fremont or Dublin/Pleasanton trains. Please plan to arrive early to Oracle Arena to avoid missing tip-off (5:00 p.m.) as your 2015 NBA Champions take on the 76ers. Oracle Arena doors will open at 3:30 p.m.
BART crews will be performing vital repairs to the equipment and tracks between San Leandro and Bay Fair stations during this time. Check bart.gov for the most up-to-day information about the closure.